How often Garage of Horror runs, and how the stories are slanted, depends on you. Want to become famous and share your misery/madness/mirth with the world? 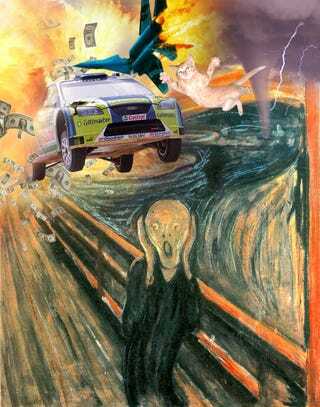 Is the cat/rally car/massive explosion in the above picture yours? Drop us an email with "Garage of Horror" in the subject line. (If you need inspiration, try here.) Vote early, vote often, and remember, never cut the funny.